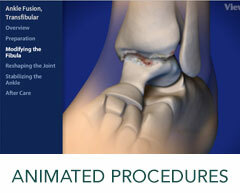 Arthroscopy is a minimally invasive procedure that allows doctors to examine tissues inside the knee. It is often performed to confirm and treat pathology diagnosed after a physical examination and other imaging tests such as MRI, CT or X-rays. During an arthroscopic procedure, a thin fiberoptic light, magnifying lens and tiny camera are inserted into the knee, allowing your doctor to examine the joint in great detail. For some patients, it is then possible to treat the problem using a few additional instruments inserted through small incisions around the joint. Sports injuries are often treated with arthroscopic surgery. Knee injuries that are frequently treated using arthroscopic techniques include meniscal tears, mild arthritis, loose bone or cartilage, ACL and PCL tears, synovitis (swelling of the joint lining) and patellar (knee cap) malalignment. To learn more about our Knee Arthroscopy Services, please contact us today to schedule an appointment!